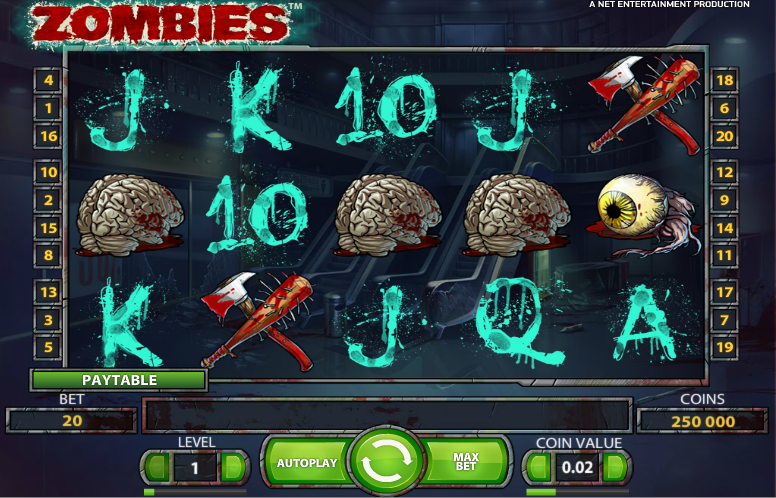 Zombies is a unique slot game with a top prize of 100,000 coins, a free spin round where zombies are shot to reveal big cash prizes and not one, not two but three different wild symbols to help you increase your winnings! This thrilling game has 20 paylines and so many different features, it’s almost unbelievable. To start, the game has awesome graphics and creepy music that plays. During the free spins feature, the moans of the encroaching zombies can be heard. 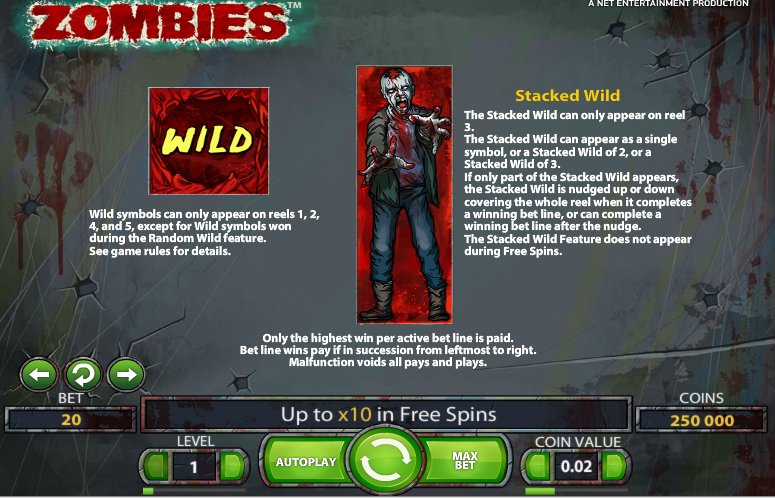 Players can earn higher bonuses during the free spins as between each spin, zombies are being shot down to collect a growing bonus amount that is multiplied by an increasing multiplier of up to five by the time the last free spin occurs. There are three different types of wild symbols, including a stacked wild that will be nudged up or down after completing a combination or if it will complete one after moving. The max payout is 100,000 coins and players can get a top payout is 10,000 coins for the highest paying symbol (without multipliers). This leaves plenty of room to win big. To win the top payout of 100,000 coins, players need to spin at the maximum bet level 10. This involves betting a total of 200 coins if you are playing on the max coin value. Using any lesser coin value makes it worth the same amount of coins but coins won are multiplied coin value to produce the true value of your win. So to win the top jackpot you need to spin in 5 of the chainsaw symbols (worth 1000 coins) on bet level 10 during free spin rounds with a 10x multiplier attached. It sounds a little complex but it’s really just win value x bet level x multiplier. 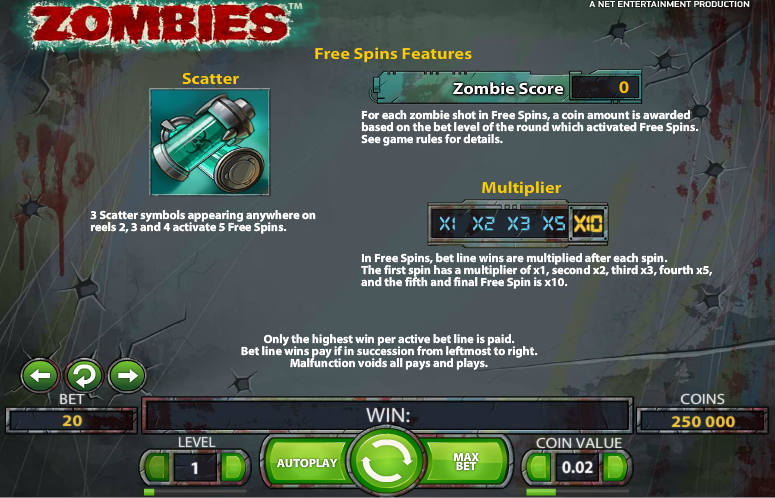 Free Spins: The free spins are obtained by spinning the reels and getting three or more of the scatters (serum/vile). This will automatically reward the player with 5 free spins. They are taken to a different set of reels, which do not include the stacked wild or random wilds, and the first spin starts. While the reels are spinning, they fade away and players are left to look at what appears to be a mall with zombies patrolling the top floor. 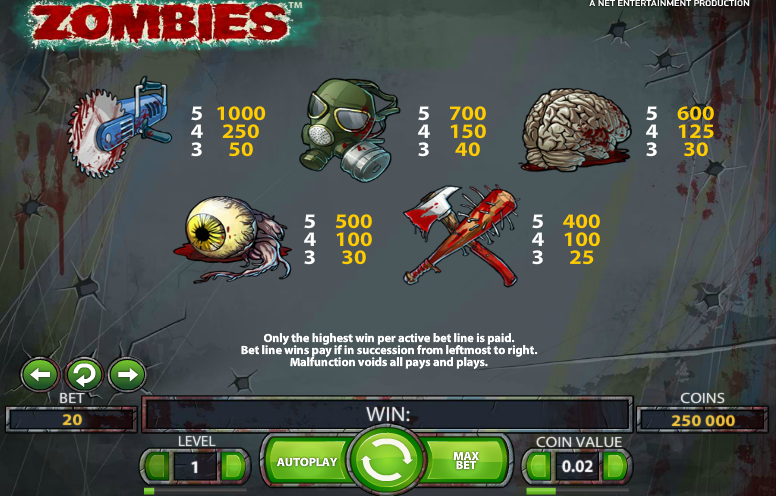 The game will automatically shoot a few zombies for bonuses and then return to the reels to collect free spin payouts. It does this during every spin, increasing the bonus amount each time. For the free spins themselves, there is a multiplier that increases with every spin. It start with 1x for the first spin then moves to double for the second spin and so on up to 10x on the fifth and final spin. This multiplier applies only to the payout for winning combinations on the reels. At the end of the feature, the zombie total and the free spin total are added together and paid out. Regular Wild: The regular wild looks like a bullet hole with “wild” stamped on it. This is the same symbol used by the random wild bonus feature. They are not the same thing, though. The regular wilds only appear on the first, second, fourth, and fifth reels. Random Wild: This random feature will only occur randomly after spins during which no free spins are activated or stacked wilds appear. Up to six symbols will randomly become wild symbols. This feature will not occur during the free spins. Stacked Wild: This symbol actually takes up three spots on the third reel and is a zombie. One, two, or three spots on the display will be taken up by the zombie. Anytime is completes a win it will be nudged up or down to attempt another win. It will also be nudged if it will complete a win by moving one spot up or down. This wild does not occur of the free spin feature. Buzz Saw: This handy to have power tool can slice through zombie flesh much easier than a regular chain saw. Players will be paid 1,000 credits for five tools on one of the paylines. Four saws pay 250 credits and three saws pay 50 credits. Gas Mask: Just in case whatever is turning the other into zombies is airborne, players have this to protect them. It offers the second highest payouts of the game with 700 credits for five symbols, 150 credits for four symbols, and 40 credits for three symbols. Brain: This essential, protein-rich part to a balanced Zombie diet pays 30 credits, 125 credits, or 600 credits for three, four, or five organs appearing on a payline, respectively. Eyeball: It is unknown if zombies ripped it out of someone’s face or if it is from a Zombie who got its head exploded by a shotgun, but this gory organ is shown in a puddle of blood and has exquisitely gruesome detail. Players earn 500 credits for five eyeballs landing on a payline and 100 credits for four of them. Three eyeballs pay 30 credits. Axe and Bat: These two essential zombie fighting weapons are combined onto a single symbol that awards 25 credits for sets of three symbols. Four symbols award 100 credits and five symbols will pay 400 credits. 10-A symbols are also available but pay significantly less than those listed above. Players have to bet all 20 paylines in this game, there is no option to change this. The coin values are for 0.01 coins up to 1 whole coin and players can increase their bet level up to 10, which means they are betting ten coins on each line. The minimum total bets are 0.20p per spin for the min and £200 per spin for the max. To win the max coin jackpot players need to be using bet level 10, any coin value can be used. This game has a rating of 5 / 5 with 314 total reviews by the users.